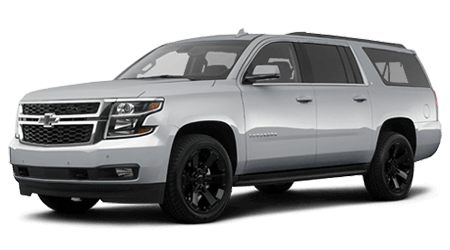 If you are shopping for a new SUV to transport your family around Austin, Texas and beyond, the 2019 Chevy Suburban offers the utility of a pickup truck with the touchpoints and refinements one typically finds in a luxury sedan. To get behind the wheel of the latest Suburban and command a powerful V8 engine, schedule your test drive in advance. Opt for the available 6.2-Liter V8 and enjoy 420 horsepower. We invite our San Antonio and Round Rock to explore our nearby new and used car dealership. Along with an available built-in 4G LTE Wi-Fi Hotpost and up to 14 charging points, the 2019 Suburban comes with an 8-inch diagonal touch-screen display with available phone integration. Drivers who take home the Suburban Premier 4WD will enjoy Keyless Open, Keyless Start, Front and Rear Park Assist. If you're looking for a new SUV with Apple CarPlay® and Android Auto™, both are included with the Chevrolet Infotainment System with Navigation. You'll also have Bluetooth® streaming audio for music and select phones and an Auxiliary jack for connecting portable media devices. When you are ready to lease or finance your new Suburban, meet with our finance department. The 2019 Chevrolet Suburban is the SUV designed to help keep you and your family safe. If you are looking for safety in an SUV, the new Suburban is loaded with passive and active driver-assist features. Along with the Premium Smooth Ride suspension found on the Suburban LS and Suburban LT, one finds Daytime Running Lamps, LATCH System, and Rear Vision Camera all standard. The StabiliTrak, electronic stability control system with traction control, Teen Driver, and Tire Pressure Monitoring System are also standard in the LS, LT, and Premier trims. Motivated by a 5.3-Liter Gas V8, the rear-wheel-drive Suburban delivers 355 horsepower and 383 pound-foot of torque. This powerplant mates to a 6-speed automatic, electronically controlled transmission. Upgrade to the 4WD 6.2-Liter V8 for a 10-speed automatic transmission. Drivers of this engine will also have 420 horsepower. If you have large watercraft or all-terrain-vehicles to haul, conventional trailering in the 2WD model is 6,300-pounds. After you take home your new Chevy Suburban, keep it running like the day you drove off the lot with regular maintenance from our service department. Walking around the exterior of the 2019 Suburban, one's eye quickly notices the Black assist steps, Heated power outside mirrors, and Black roof-mounted side rails. Inside the cabin, the style continues with Premium Cloth front bucket seats, Steering-wheel-mounted controls, and Leather-wrapped steering wheel on certain trims. Be sure to choose the Suburban Premier or LT if you want your new SUV to have the Memory Package.